Eaton Freedom series adder block IEC auxiliary contact has contact rating of 10-Amps at 600-Volt AC and 5-Amps at 250-Volt DC. With silver cadmium alloy contact, the auxiliary contact supports side mounting and has 1 NC contact configuration. This NEMA 3-5 size auxiliary contact has snap on terminal connection. 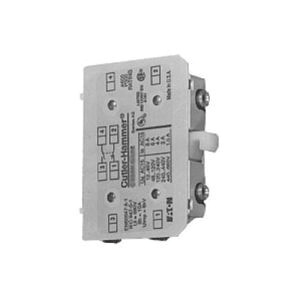 The auxiliary contact is applicable for use on IEC Size L-S 100 - 400-Amp contactor/starter. Auxiliary contact is UL listed and CSA certified.